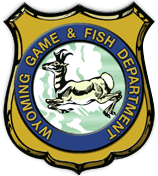 Our Bighorn River Fly Fishing Guide Service is conveniently located in west central Wyoming, in the beautiful town of Thermopolis. 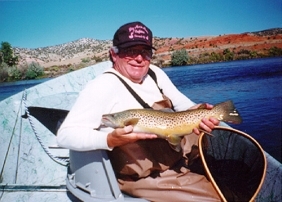 Thermopolis and Big Horn River Outfitters will provide enjoyment to all, young and old. The Bighorn River starts its northerly flow in the Wind River Mountains, some 200 miles southwest of Thermopolis, under a different identity, the Wind River. The Wind River becomes a tailwater after being released from Boysen Dam some 13 miles south of Thermopolis. This release of water provides excellent Bighorn River Trout Fishing. The rivers name changes to the Bighorn River upon exiting Wind River Canyon, at the sacred "Wedding Of The Waters". We provide the finest Bighorn River Fly Fishing Guides on this stretch of the River. The Bighorn River continues north into Montana, flowing into the Yellowstone River, then into the Missouri, ultimately ending up in the Pacific Ocean. Join Our Bighorn River Fly Fishing Guide Service and we will take you rainbow trout fishing, brown trout fishing, and cutthroat trout fishing. From the time our local trout hatch and reach 16 inches long these fish grow at a rate of 3 inches per month, which proves to be one of the fastest growth rates in the United States for fish in a free flowing stream. The average Trout weight is 3 to 4 pounds with lengths of 18 to 19 inches, with some rainbows and browns reaching over 10 pounds with lengths of over 30 inches. We have caught and released cutthroat trout weighing over 6 pounds with lengths of 25 inches. 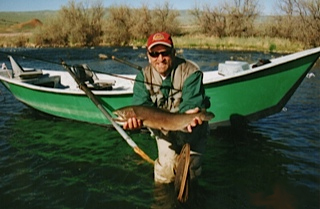 Big Horn River Outfitters provides guided fly fishing trips based out of Thermopolis, Wyoming. Our amazing little town offers a unique opportunity not only for the avid angler but the entire family. Reminisces of the wild west can be seen when you visit petro-glyphs on nearby cliffs while imagining what life must have been like when those drawings were sketched on these walls. You can also visit the hole in the wall where Butch Cassidy and the wild bunch hid out. Thermopolis also has a pioneer museum as well as a wax museum. If you are into something that will raise the adrenaline level a little more, you can take a white water trip down class three and four rapids in Wind River Canyon while experiencing the amazing scenery provided by the 2000 to 3000 foot vertical walls in this amazing Canyon. You can drive the foothills around this beautiful valley and view abundant wildlife including, antelope, whitetail and mule deer, elk, moose, bear, wild turkey and bighorn sheep. You can drive through herds of buffalo in Hot Springs State Park, or you can rent a ski boat or jet skis and enjoy the water in Boysen Reservoir 20 miles South of Thermopolis. You can enjoy nine holes of golf at our municipal golf course or shoot a quick round at the mini putt putt course. If you time it right, you can catch the county fair, a PRCA rodeo, the demolition derby, or a fun night of pig wrestling. You may also walk through a classic car show or watch Native Americans dance during the pageant day's festival. If you're into horseback riding it is available for you to experience this amazing scenery and incredible abundant wildlife up close. Fishing is not the only thing enjoyed on this amazing river, kayaking, rafting, tubing, and swimming are also enjoyed on hot summer days. There are several restaurants in thermopiles that can provide you with a hearty breakfast, filling lunch, and fine dinner, and when your day is through, there are several hotels and motels to provide you with a great nights rest. When you call Big Horn River outfitters to book your fly fishing adventure, ask about all of the wonderful things that are available to do in this area to provide you with a trip you will cherish for a lifetime. So whether you are Bighorn River spin fishing or Bighorn River fly fishing, fishing nymphs, streamers or dries, Reggie will give you his promise that "Every cast has the potential for hooking a trophy of a lifetime, and with each cast, myself, and staff, will do all in our power to provide you with the fly fishing trip you will cherish for a lifetime". Bighorn River Outfitters can be best reached at 307-272-3474 to Book your next Bighorn River Guided Fly Fishing Adventure.